Ion-Beam Processingâ€"Spire Corp. (Bedford, MA). Light-Activated Surface Modificationâ€"BSI Corp. (Eden Prairie, MN). Plasma Surface Engineeringâ€"Talison Research (Sunnyvale, CA). Antimicrobial/Antibiotic Coatingsâ€"STS Biopolymers, Inc. (Henrietta, NY). Thromboresistant (Heparin) Coatingsâ€"Baxter Healthcare Corp. (Irvine, CA). Although every medical manufacturer desires to construct its devices from entirely safe materials, the reality is that not all materials are entirely safe. Generally, if one looks long enough at small enough quantities, some type of risk can be associated with every material. risk = severity x probability. While this equation appears useful in theory, in practice it is difficult to apply to the biological safety of medical devices. The process known as health-based risk assessment attempts to provide an alternative strategy for placing health risks in perspective. Although devised primarily for cancer risk assessment, many of the provisions also apply to the assessment of other health effects. The major components of the paradigm are (1) hazard identification, (2) dosage-response assessment, (3) exposure assessment, and (4) risk characterization. This general approach to risk assessment was adapted to medical devices via the draft CEN standard Risk Analysis, and more recently via the ISO standard, ISO 14538-Method for the Establishment of Allowable Limits for Residues in Medical Devices Using Health-Based Risk Assessment. At the present time, FDA is also working to develop a health-based risk assessment protocol adapted to medical devices. Informally called the Medical Device Paradigm. Some manufacturers may object that regulators are once again attempting to impose a "drug model" on medical devices. However, we shall see in the following pages that judicious application of these risk assessment principles can provide a justification for using materials that carry with them some element of risk, and that may, under traditional biocompatibility testing regimes, be difficult to evaluate or be deemed unsuitable for medical device applications. The first step in the risk assessment process is to identify the possible hazards that may be presented by a material. This is accomplished by determining whether a compound, an extract of the material, or the material itself produces adverse effects, and by identifying the nature of those effects. Adverse effects are identified either through a review of the literature or through actual biological safety testing. The second step is to determine the dose response of the material-that is, what is the highest weight or concentration of the material that will not cause an effect? This upper limit is called the allowable limit. There are numerous sources in the literature of data from which to determine allowable limits; some will be more applicable than others, and some may require correction factors. The third step is to determine the exposure assessment by quantifying the available dose of the chemical residues that will be received by the patient. This is readily done by estimating the number of devices to which a patient is likely to be exposed in a sequential period of use (for instance, during a hospital stay) or over a lifetime. For example, a patient might be exposed to 100 skin staples following a surgical procedure, or to two heart valves in a lifetime; thus, the amount of residue available on 100 skin staples or two heart valves would be determined. Characterizing the risk constitutes the final step of the process. The allowable limit is compared with the estimated exposure: if the allowable limit is greater than the estimated exposure by a comfortable safety margin, the likelihood of an adverse event occurring in an exposed population is small, and the material may be used. Nitinol is an unusual alloy of nickel and titanium that features the useful property of "shape memory." A nitinol part can be given a particular shape at a high temperature, then cooled to a low temperature and compressed into some other shape; the compressed part will subsequently deploy to its original shape at a predetermined transition temperature. This feature is particularly beneficial for vascular implant applications in which the shape of the device in its compressed state eases the insertion process. The nitinol deploys as it is warmed by the surrounding tissue, expanding to take on the desired shape of a stent, filter, or other device. The transition temperature depends on the alloy's relative concentrations of nickel and titanium: a typical nickel concentration of 55-60% is used in medical devices, since this gives a transition temperature at approximately the temperature of the body (37Â°C). Hazard Identification. One concern with using nitinol in implant applications is the potential release of nickel into the body. Although nickel is a dietary requirement, it is also highly toxic-known to cause dermatitis, cancer subsequent to inhalation, and acute pneumonitis from inhalation of nickel carbonyl, and to exert a toxic effect on cellular reproduction. It is a known sensitizer, with approximately 5% of the domestic population allergic to this common metal, probably through exposure from costume jewelry and clothing snaps. The biocompatibility question at hand is whether or not in vivo corrosion of nitinol releases unsafe levels of nickel. Dose-Response Assessment. A search of the world medical literature revealed that the recommended safe level of exposure to nickel in intravenous fluids is a maximum of 35 Âµg/day. This value can be taken as an allowable limit of nickel exposure for a 70-kg (154-lb) adult. The intravenous fluid data are based on subjects that are comparable to the patients who will be receiving nitinol implants. The data are for humans (not animals), for ill patients (not healthy workers or volunteers), and for similar routes of exposure (intravenous fluid and tissue contact). For these reasons, no safety correction factor need be applied to the allowable limit of exposure. Exposure Assessment. The available dose of nickel from nitinol implants can be estimated from data found in the literature. In one study, dental arch wires of nitinol were extracted in artificial saliva, and the concentration of nickel measured in the supernatant. Corrosion reached a peak at day 7, then declined steadily thereafter. The average rate of corrosion under these conditions was 12.8 Âµg/day/cm2 over the first 28 days. Risk Characterization. A comparison of the available dose with the allowable limit for intravenous fluid levels shows that there is approximately a threefold safety margin, assuming that the implanted device is a full 1 cm2 in surface area. (Devices with less surface area will contribute even less to the nickel concentration and have an even larger safety margin.) 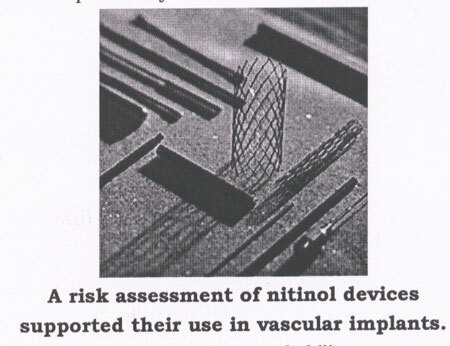 Considering the high quality of the data, a threefold safety margin is sufficient to justify using nitinol in vascular implants. Today's wound dressings are highly engineered products, designed to maintain the moisture content and osmotic balance of the wound bed so as to promote optimum conditions for wound healing. Complex constructions of hydrocolloids and superabsorbers, these dressings are sometimes used in direct tissue contact over full-thickness wounds that penetrate the skin layers. Hazard Identification. There have been reports in the literature of patients succumbing to cardiac arrest from potassium overload, with the wound dressing as one of the important contributors of excess potassium in the bloodstream. The effects of potassium on cardiac function are well characterized. Normal serum levels for potassium are 3.8 to 4 milliequivalents per liter. As the potassium concentration rises to 5-7 mEq/L, a patient can undergo cardiac arrest and die. The biocompatibility issue to be explored is whether or not a wound-dressing formulation might release dangerous levels of potassium if used on full-thickness wounds. Dose-Response Assessment. An increase of approximately 1 mEq/L of potassium is likely to provoke mild adverse events in most patients. Assuming that the average person's blood volume is 5 L, a one-time dose of 5 mEq of potassium may begin to cause adverse reactions. This value can be considered to be the allowable limit of potassium for most patients. Exposure Assessment. Let us suppose that each dressing contains 2.5 g of potassium bicarbonate. Since the molecular weight of potassium bicarbonate is 100 g/mole, each dressing contains 0.025 mole of sodium bicarbonate, or 0.025 mEq of potassium ion. If a patient were to use four dressings in a day, the available dose of potassium would be 0.1 mEq/day. Risk Characterization. Comparing the available dose of potassium (0.1 mEq) to the allowable limit (5 mEq) shows that there is a 50-fold safety margin. Considering that patients may be small in size, may have kidney impairment, or may receive potassium from additional sources such as intravenous fluids, this safety margin is too small, and so the dressing should be reformulated. A manufacturer of metal fabricated parts uses perchloroethylene to clean the finished pieces. Perchloroethylene has many advantages as a cleaner and degreaser: it is highly volatile, does not damage the ozone layer, and is very effective as a precision cleaning solvent. The most common use of perchloroethylene is in the dry cleaning industry, but it is also commonly used in the electronics industry to clean circuit boards. Hazard Identification. The downside of perchloroethylene is that it is highly toxic, with a material safety data sheet several pages in length listing adverse effects ranging from dizziness to death. Biocompatibility testing on solvent-cleaned parts would be meaningless; the solvent concentration on the part is so small that any effects of the solvent would be masked by the natural biological process of the test animals. The biocompatibility question that must be answered is whether or not sufficient residual perchloroethylene remains on the cleaned metal parts to pose a health hazard. Dose-Response Assessment. Threshold limit values (TLVs) are values that indicate the maximum level of a chemical that a healthy worker could take in on a daily basis over the course of his or her work life without experiencing any adverse effects. The TLV for perchloroethylene is 50 ppm/day (50 ml of perchloroethylene per 103 liter of air) by inhalation. The average person inhales 12,960 L of air per day, making this equivalent to 650 ml of perchloroethylene per day. Since the vapor density of perchloroethylene is 5.76 g/L, the TLV is equal to 3.7 g of perchloroethylene per day by inhalation. Because TLVs for inhalation-as opposed to direct tissue exposure-are determined based on healthy individuals (not ill patients), we will divide the TLV by an uncertainty factor of 100, i.e., 10 to account for a different route of exposure and 10 to account for healthy-to-ill persons. By this method, we obtain an allowable perchloroethylene limit of 37 mg/day. Exposure Assessment. To calculate an available dose of perchloroethylene, we need some additional information. In this case, the manufacturer brought a number of cleaned metal pieces into equilibrium within a closed jar, then analyzed the headspace above the pieces by using high-pressure liquid chromatography to determine the concentration of perchloroethylene released. 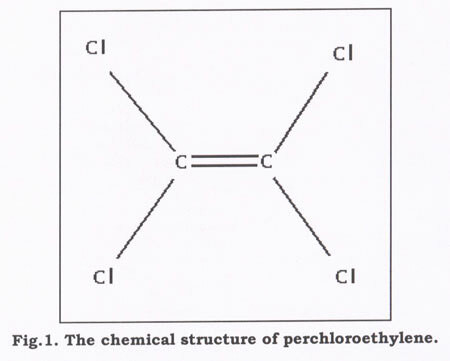 The concentration of perchloroethylene was undetectable by high-performance liquid chromatography. Since the limits of this analytical method are 2 ppb, this value was taken as the concentration of perchloroethylene in the headspace. Taking the weight of the metal pieces, the number of pieces tested, and the volume of the headspace, it was calculated that the amount of perchloroethylene per single piece was a maximum of 1.0 ng/piece. If we suppose that a patient might be exposed to a maximum of 50 pieces over a lifetime, then the maximum available dose of perchloroethylene from the pieces would be 50 ng. Risk Characterization. A comparison of the available dose (50 ng) to the allowable limit (37 mg/day) indicates an ample safety margin. A manufacturer purchases commercial, black fishing line to use as a ligature in a circumcision kit. Because the ligature is not "medical grade," a cytotoxicity test is routinely conducted as an incoming inspection test. It was assumed that a negative cytotoxicity test would be associated with an acceptable incidence of skin irritation. Hazard Identification. A newly received lot of the fishing line failed the cytotoxicity test. The extraction ratio of this material-of indeterminate surface area-was 0.2 g/ml, with a 0.1-ml aliquot of sample extract being applied to a culture dish. Thus, 0.2 g/ml x 0.1 ml = 0.02 g represents a toxic dose of fishing line. Dose-Response Assessment. A titration curve was obtained on the sample extract. If the sample was diluted 1:2, the test was still positive; however, if the sample was diluted 1:4, the test was negative. Thus, 0.02 g/4 = 0.005 g of fishing line, the maximum dose that is not cytotoxic. This value was called the allowable limit of fishing line. Exposure Assessment. Each circumcision kit contained about 12 in. of line, but only about 4 in. of the material was ever in contact with the patient. Since an 8-yd line was determined to weigh 5 g, the available dose of fishing line was calculated to be 5 g/288 in. x 4 in. = 0.07 g.
Risk Characterization. A comparison of the available dose (0.07 g) with the allowable limit (0.005 g) convinced the manufacturer to reject the lot of fishing line. Sterilization, as a specific discipline, has been with us for approximately 120 years, since the invention of the steam autoclave by Charles Chamberland in 1879. Since that time, we have seen progressive refinement in steam sterilizers: from the early, manually operated equipment to modern microprocessor-controlled, automatic machines. Although the efficiency, reliability, and performance monitoring of modern equipment is continually improving, the fundamental process remains essentially the same. Sterilization processes cannot be considered in isolation; rather, they are inextricably related to the product to be sterilized. They are also related to the packaging of the sterilized product. Except for the rare instances when the sterilizer can be located where the sterile goods are to be used, there is a need for the sterilized products to be packaged in a manner that will preserve their sterility during storage, handling, and transport. The majority of sterile goods produced in the medical device industry and in healthcare facilities are terminally sterilized-that is, they are sterilized already packaged. They may be packaged only in their primary packaging or in multiple layers of packaging such as a unit pack, shelf pack, and shipping carton. For a product sterilized in its packaging, the packaging material must be compatible with the sterilization process. This requires both that the packaging tolerates the process without adverse effects on its performance characteristics, and that it permits the attainment of the specified sterilization conditions in the product to be sterilized. There is no single sterilization process that is suitable for all medical products. The diversity in sterilization processes-and of operating systems within each process-has arisen as a consequence of the efforts made to optimize medical sterilization and to meet the differing needs imposed by the vast range of products to be sterilized. The sterilization processes that have traditionally been used for medical products include steam, ethylene oxide (EtO), ionizing radiation (gamma or E-beam), low-temperature steam and formaldehyde, and dry heat (hot air). These methods can be divided into three categories, based on the nature of the sterilant and its reaction with microorganisms: physical processes (ionizing radiation, dry heat); physicochemical processes (steam, steam/formaldehyde); and chemical processes (EtO, glutaraldehyde). Chemical and physicochemical processes depend on direct physical contact between molecules of the sterilant and the microorganism to be killed. In consequence, access must be available to the surfaces of the product to be sterilized and the packaging material (for terminally sterilized products) must be porous or permeable to these molecules. For example, in the case of steam sterilization of dry products, the air must be removed from the package and replaced with steam in direct contact with the product. This is necessary both to provide the required thermal energy by condensation of the steam and the required water for the protein hydrolysis reaction to occur. At the same temperature in the absence of water, the degradation of proteins would occur at the much slower rate characteristic of dry-heat processes. Purely physical processes such as ionizing radiation may be used for product designs and packaging materials that are impermeable to gases as long as they are "transparent" to energy of the wavelengths employed in the sterilization process. What do we mean by a new sterilization process? New is often a marketing description for the latest outcome in a gradual development and refinement of an existing process. Continued development or refinement in one area allows, and sometimes requires, development in another. This advance may be driven by the product, the sterilization process, the packaging, economics, or other external forces. Over the past two or three years, the development of the art of sterilization seems to have accelerated, with the introduction of several new processes. At least one reason for this is the potential decline in the use of EtO in hospitals. This is a result both of increased concern over the toxicity of residuals and of the need to eliminate the use of chlorofluorocarbons (CFCs), which had previously been employed to minimize the flammability and explosion risks of the EtO. Another prominent trend is the proliferation of various minimally invasive therapies, and the need for appropriate sterilization protocols for the equipment used in these procedures. It is important to note that one must consider two very different fields of application for sterilization processes-industrial and hospital. Although the same level of sterility assurance should be provided in each case, the operational circumstances are sufficiently different that the two fields need to be considered separately. In industry, a sterilizer will typically be used to process virgin product with a known bioburden. The range of products will be limited and may be a single product type or single product family of closely related types. There will normally be good engineering and analytical laboratory support, and the process will be subjected to in-depth validation and routine monitoring. All of the personnel involved will be specifically trained in the process. Contrast this with the situation found, all too often, in hospitals. A diverse range of reusable products will be processed after being subjected to a largely unvalidated cleaning process. The extent and nature of residual soiling and bioburden will be unknown. The process will be subject to minimal validation-certainly not covering the diversity of products processed-and only rarely will there be adequate support from an analytical laboratory. The expectation will be that the process should be simple to operate and safe for use by personnel with minimal training. Medical instrumentation can be sterilized through a hydrogen peroxide gas plasma process with the Sterrad 100 system (Advanced Sterilization Products). Whereas the most widely used traditional chemical processes were based on alkylating agents such as EtO and the various aldehydes, most of the new methods are oxidative processes based on "peroxy" compounds. These include sterilants based on compounds such as hydrogen peroxide, peracetic acid, peroxysulphates, chlorine dioxide, and ozone. For the most part, the microbicidal action of these chemicals has been recognized for many years. Peracetic acid is currently used in a number of sterilization processes. Examples include liquid systems such as the Steris machine (Steris Corp., Mentor, OH) for endoscopes, or use as a liquid sterilant in suitable disinfectors for sterilization of thermolabile endoscopes. Vapor-phase generators employing peracetic acid are being sold for the decontamination, disinfection, or sterilization of products such as isolators. The process itself is not new, as the bactericidal activity of peracetic acid was noted by Greenspan and MacKellar in 1951. It was used in solution as a sterilization process as early as 1955, and, in the vapor phase, by Portner and Hoffman in 1968. Aerosolized peracetic acid for the sterilization of surgical instruments was considered by Werner and others in the early 1970s. Peracetic acid is a colorless liquid with a pungent odor, miscible with water. Commercially available as a 35% or 40% solution, it is generally unstable, decomposing to give oxygen, acetic acid, and other degradation products, which include hydrogen peroxide and water. Acetic acid and hydrogen peroxide are invariably present in low concentration. Peracetic acid is corrosive to certain materials and it is lachrymatory, an irritant, and a vesicant (causing blistering) on prolonged contact. Its use as a sterilant therefore relies on obtaining formulations that inhibit corrosion of sensitive materials and stabilize the solution to give it a usable shelf life. The Steris system currently available for the sterilization of endoscopes is-like the glutaraldehyde system it is intended to replace-a wet system. This limits its applicability, since it becomes difficult to provide a system for packaging and storage of the sterile product. In common with any other liquid chemical system, water is used to flush out any residual chemical at the end of the process. Ensuring that this water is of suitable chemical purity and microbial quality to prevent recontamination of the processed goods requires thorough control. The vapor-phase process has found applications within industry for decontamination of environmental spaces, but there has been no move toward the development of a general-purpose peraceptic-acid sterilization process, and none seems likely. The deep-vacuum hydrogen peroxide process operates in a manner analogous to gas sterilization processes. Initial air removal allows for rapid diffusion, and humidity is controlled to optimize the microbicidal effect. The process is compatible with a wide range of materials, but traditional packaging is likely to interfere with the process because of its reaction with, or high absorption of, the hydrogen peroxide. Although the process is finding extensive use in the sterilization of lyophilizers, a general-purpose unit is not yet available. The bactericidal and sporicidal effect of ozone has long been recognized. Its use as a sterilant, however, has been limited because of its instability, which precludes storing it ready for use, and because of the difficulty of generating pure ozone. Ozone is produced naturally by the effect of sunlight or ultraviolet light on oxygen, and also by electrical discharge. Recent technological advances have made the generation of ozone a more practicable proposition, and commercially available sterilizers have been developed. The Cyclops Co. has introduced a machine for sterilizing endoscopes that pumps humidified ozone through the unit. Advantages of the system are said to include freedom from long-term toxic residuals and ease of use, with only medical-grade oxygen and electrical connections required. Potential disadvantages include the reactivity of ozone with certain materials. Chlorine dioxide (ClO2), which is a gas at temperatures above 11Â°C, was discovered by Sir Humphry Davey in 1811 and is another chemical that has long been known to have microbicidal properties and that has, like ozone, been used in water purification systems. The germicidal and sporicidal properties of chlorine dioxide have been recognized since 1936 (Leseurre) and 1949 (Ridenour et al. ), respectively. Many disinfection technologies employ chlorine dioxide in aqueous solution and, when necessary, use nitrogen or air purging to remove the traces of residual gas. The major problems with this technology have always been that chlorine dioxide gas cannot be safely liquefied or stored under pressure for transport and subsequent use (since under these conditions it is explosive), and that as an aqueous solution it is unstable and corrosive. Recent developments have seen the use of both gaseous and liquid chlorine dioxide systems. Gaseous Systems. In the system developed by Johnson & Johnson, the chlorine dioxide is generated in situ by the action of chlorine on sodium chlorite. The chlorine is presented as 2% Cl2 in N2, in a cylinder filled initially to 2700 psig and then emptied to 300 psig; the chlorine accounts for a pressure of 60 psig. The generator employs a two-column system, with discharge of the chlorine into the first column pressure controlled and monitored, and output from the generator monitored by a fiber-optic UV absorption system. The working life of the column is limited to 70% of its theoretical capacity, as established by validation studies, in order to ensure that the conversion process will always take place effectively. The second column is used as a backup. The sterilizer is operated at slightly above room temperature (32Â°C), which allows for good control over the process. The process uses a cycle analogous to that of EtO sterilizers, with a vacuum air-removal stage followed by a dynamic conditioning stage to humidify the chamber and load to an RH of about 70%. At the end of the conditioning phase, ClO2 gas is admitted to give a concentration of 30 mg/L. This is then topped off by the addition of N2 at pressures of 80 kPa. A total gas exposure time of about 60 minutes is standard. At the end of the cycle, the ClO2 is removed using a four-pulse dynamic air exchange. Advantages of this process compared with EtO are that-because ClO2 does not have the chemical solubility of ethylene dioxide-there are no significant levels of residual sterilant within the product material, and that ClO2 is not flammable in air at the concentrations employed. Gaseous ClO2 may be removed from the effluent airstream by scrubbing with Na2S2O3. Residual levels for discharge to the atmosphere can be well below 1 ppm and are usually undetectable. The gaseous chlorine dioxide system is currently being used in several medical applications, including the sterilization of contact lenses and the secondary sterilization of overwrapped foil suture packages. Liquid Systems. Solutions of chlorine dioxide are also commercially available as liquid sterilants-under trade names such as Tristel and Medicide-and as such compete with glutaraldehyde and peracetic acid solutions. While the microbicidal efficacy of chlorine dioxide has long been recognized, there have been two problems associated with the use of liquid systems. First, the solutions are unstable, with the concentration of ClO2 rapidly diminishing; second, because chlorine dioxide is highly oxidative, it is potentially corrosive to many materials. The development of usable solutions has therefore required formulations that incorporate stabilizing agents, usually based on boron components and anticorrosion compounds. These comprise a base solution and an activator which, when mixed, yield a solution of approximately 0.1% chlorine dioxide, with a 14-day shelf life. Solutions of this type are increasingly being used for the sterilization of fiber-optic endoscopes. Plasma is the fourth state of matter, and as such is distinguished from solids, liquids, and gases. Plasmas are produced at very high temperatures, or at low temperatures in strong electromagnetic fields (the so-called "glow-discharge" plasmas). The plasma usually consists of a reactive cloud of ions, electrons, free radicals, and other neutral species. The plasma process seeks to produce a sterilizing effect using lower concentrations of sterilant-with a higher reactivity-than would be possible in a normal gas process. Because the active species are only present when power is applied to the system and disappear quickly when the power is turned off, the very active species that act as the sterilant will not be present as a source of toxicity at the end of the process. The precursor gas selected for plasma generation will determine which active species are present, and these may be expected to influence the comparative microbicidal activity of the system. When a plasma contacts the surface of an item to be sterilized, the collisions between the active species and other molecules cause a significant proportion of the active species to return to the ground state. Packaging material can thus cause a serious depletion in the concentration of active species reaching the item to be sterilized, soiling on the surface may have a significant inhibitory effect, and the extent of diffusion into narrow lumens may be limited. The Sterrad Process. 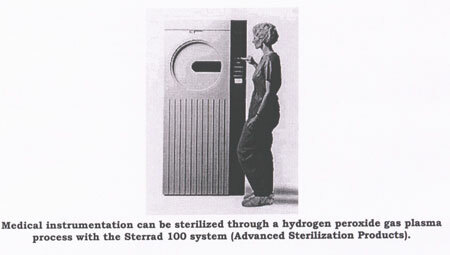 The Sterrad process (Advanced Sterilization Products, Johnson & Johnson Medical Inc., Arlington, TX) is a plasma system that uses hydrogen peroxide as the source of the active species. The process seeks to overcome the inhibitory effect of packaging materials by using a gas-diffusion phase to allow gas to penetrate to all parts of the load before the plasma is created. The adequacy of this approach depends on the certainty with which one can ensure that the hydrogen peroxide gas diffuses to all parts of the load and that the nature and construction of load items will not inhibit subsequent plasma formation. Although this system is becoming widely adopted, there are still reservations about its use in hospitals-where product cleaning prior to sterilization may not have been well controlled, where inappropriate products may be processed, and where parametric release may be used without supporting evidence comparable to that required for other processes. The inclusion of steam sterilization in the context of recent developments in sterilization technology may at first seem strange. However, there is a continuing evolution of the equipment, packaging, and monitoring systems used for the process. The publication of EN 554 has stimulated renewed interest in ensuring appropriate steam purity for product contact. One continues to see progressive refinement of the microprocessor-based control systems and, in particular, of secondary or supporting functions, such as providing users with a prompt when maintenance is required. Control systems are becoming much more user-friendly, with touch screen systems becoming commonplace. Improvements continue to be made in related steam sterilization supplies such as packaging materials and biological and chemical indicators. An interesting example of the development of sterilization techniques for specific applications is the recently reported use of ultraviolet light in combination with psoralens to purge blood plasma and platelets of pathogenic organisms. Psoralens are naturally occurring substances found in a wide range of plants, in which their role is to fight infection from pathogenic fungi. Irradiation of blood with UV light has been recognized as a method of treating otherwise intractable infections ever since its development in the 1930s for use with polio patients. It is reported that the fundamental effect of exposure to UVA is to stimulate the body's biochemical and physiological defenses. Researchers have speculated that this is related to the low concentration of ozone produced from the oxygen circulating in the blood. Ultraviolet blood-irradiation therapy is currently under investigation for the treatment of diseases such as HIV infection and hepatitis, and is the method of choice for the treatment of cutaneous T-cell lymphoma. 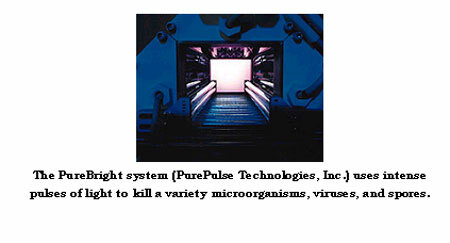 The use of UV is also noted for its ability to inactivate viruses while preserving their antigenic properties for the preparation of vaccines. The recent proliferation of novel blood-borne viruses has led to demands for better safety guarantees for blood products, and hence many methods of sterilization have been extensively examined. It has become clear that most viruses are quite sensitive to UVB or to UVA when used with psoralens as photosensitizing agents. The psoralens form a labile bond with DNA and RNA which, upon exposure to UV light, becomes a firm bond. Recent work by Cerus Corp. (Concord, CA) appears to show that synthetic psoralens and UV irradiation can be used to destroy infectious agents such as HIV, hepatitis viruses, and toxemia-inducing bacteria. However, it has been thought that producing viral inactivation of sufficient magnitude was not feasible without causing intolerable damage to vital blood components-especially erythrocytes, in which hemoglobin blocks the penetration of UV light. The absence of genetic material in platelets, however, means that these would remain unaffected by the PUVA mechanism, and it should therefore be possible to use the technique to sterilize plasma and platelets. This possibility is currently under investigation in clinical trials. Although the psoralens and dead microorganisms would remain in the product, it is considered unlikely that they would pose a risk, given the extensive clinical history of psoralens. Sterilization methods are being marketed that propose the use of microwaves in conjunction with a bactericidal solution-a modern version of the century-old process of heating with a bactericide. The technique is being promoted for use with dental instruments and relies on heating a solution of a quaternary ammonium compound (benzylkonium chloride) to approximately 100Â°C. At present, these processes are applicable only to unpackaged instruments. Low-temperature steam in combination with formaldehyde is another traditional process that has continued to evolve. It is an example of synergism in that it brings together steam at sub-atmospheric pressure and formaldehyde gas-neither of which is markedly sporicidal-to produce a highly efficient sporicidal effect. The process has been in and out of fashion several times over its 100-year history. Concerns over the toxicity and carcinogenicity of formaldehyde have limited its acceptance in the United States, despite potential advantages over ethylene oxide. More recently, improved process control has allowed the production of sterilizers with negligible environmental emissions and very low product residual levels. Other developments have included the use of operating cycles at temperatures comparable to those employed for ethylene oxide instead of in the 70Â°-80Â°C range that was traditionally employed. The inherent advantage of microwave heating compared with other forms of heating lies in its lower power requirements. The interaction between microwaves and biological materials does not of itself appear to be lethal: rather, the lethality obtained is directly derived from the heating effect, which in turn depends on the composition of the microorganism being targeted, including its water content. Limitations related to the specifics of microwave reflectance, transmittance, and absorbance may limit applicability for device sterilization. A novel sterilization method introduced in the past several years uses high-power electrical energy to produce intense pulses of light that are claimed to provide unique bactericidal effects. Called the PureBright system (PurePulse Technologies, San Diego), the technology rectifies and converts normal building ac to high-voltage dc and uses it to charge a capacitor, which is then discharged through a specially designed xenon lamp unit. The high-voltage, high-current pulse applied to the lamp causes it to emit an intense pulse of light, which typically lasts for a few hundred microseconds. The light produced by the lamp includes a broad spectrum of wavelengths, from ultraviolet to infrared, with an intensity some 20,000 times greater than sunlight. The process is reported to be highly successful in killing microorganisms, viruses, and spores, as well as in deactivating enzymes. Its effectiveness depends in part on the ease with which the organisms to be killed can be directly illuminated. For example, organisms on porous surfaces or those suspended in turbid solutions will require higher treatment levels compared with those on smooth, continuous surfaces or transparent materials. Parametric release should be practicable, since the factors controlling the microbicidal activity can be directly, and continuously, monitored. These include both the energy output in the UV range and the lamp current, on which the intensity and spectrum of each flash depend. In use, the normal operating ranges for the system are from 0.1 to 3.0 J/cm2 per flash, with total accumulated fluences of 0.1 to 12.0 J/cm2. The number of lamps, their configuration, and the flash rate depend on the particular application. The economics of the process are encouraging, with costs as low as one cent per square meter of surface sterilized. Potential applications include the surface sterilization of packaging materials for aseptic packaging or for bioburden reduction, and the terminal sterilization of parenterals packed in transparent plastic bags or bottles (e.g., from a blow, fill, seal machine). The photoproducts from treated substrates are reported to be generally similar to those induced by exposure to sunlight and similar to, but fewer than, those produced by thermal sterilization processes. When the process is used to sterilize the surface of opaque materials, any degradative effects would, of course, be restricted to the surface. In the development of new sterilization methods, a key consideration is the data that are needed to demonstrate the efficiency of a process. Although in the United States there is a well-defined process for review of new types of hospital sterilizers, this is not the case worldwide. Furthermore, the FDA approval system does not apply to sterilizers for use in industry. The lack of any universally accepted approach to validation or process approval for new sterilizers has led to considerable difficulty for both manufacturers and users as new processes have been introduced. There is also a need for a suitable European standard providing a means for presumption of conformity to the Medical Devices Directive for sterilizers, since these have become devices within the scope of the directive. These factors have stimulated work on a standard for Validation and Routine Control of Sterilization Processes-General Requirements, which is being developed within ISO TC 198 as a common international and European standard under the Vienna agreement. A draft for public comment is expected to be published some time this year. It is to be hoped that the standard will provide a format establishing a common standard for the acceptance or rejection of new sterilizing processes. A healthy dose of innovation has been injected into plastic molding. The changes have been a boon for medical device OEMs, according to injection molders, bringing more design options, better parts, and more-consistent product batches. In the injection molding industry these days, the operative word is new-new materials are flowing into new molding machines, which are producing new kinds of parts. New processes are being used, and these processes are monitored by new types of equipment. Going back some years, medical device manufacturers were often limited to materials developed for the automotive and consumer product markets, according to Mike DeAngelo, manager of injection molding for the Burron OEM Division of B. Braun Medical Inc. But more recently, resin manufacturers have been formulating materials specifically for the medical market. The new materials offer injection molders a variety of useful properties. For implantable devices, Inland Technologies Inc. uses Bionate, a biodegradable material from The Polymer Technology Group Inc. And at Unimark Plastics Co., molders are using a clear plastic to manufacture lens carriers. This new plastic allows customers to check the quality of lenses after they've been placed in the carriers. For improved chemical resistance, Burron and Bayer Corp. (Pittsburgh) have developed a lipid-resistant polycarbonate material that helps injection-molded medical devices stand up to aggressive chemicals such as those in new chemotherapy drugs. Other materials are designed to handle the high temperatures that medical devices encounter during autoclave sterilization, which is regaining popularity. High-temperature options include PEEK, Radel, Udel, and Santoprene 8000. To add strength to medical parts, molders are turning to liquid-crystal polymers such as Questra, a strong structural material manufactured by Dow Plastics (Midland, MI). "If you drop a part molded out of Questra on your desk, it sounds like a metal part," says Stichter. The rigid, stable material is particularly good for mechanisms, she adds. Manufacturers are also boosting the strength of molded parts by using materials that contain special fillers. Glass-filled resins, for example, "make a pretty rigid structure," according to Tilak Shah, president of Polyzen Inc. (Cary, NC). Glass-filled plastics are used to make laparoscopes and other scope-related products. Fill materials offer more than strength. For example, devices made using radiopaque fill material aren't transparent to radiation. During radiation therapy, Shah notes, this fill material shields the body from radioactive sources. Few things worry medical device manufacturers more than the possibility of contamination. So Battelle Memorial Institute (Columbus, OH) is working on inert substances to take the place of potentially harmful chemicals that can leach out of polyvinyl chloride (PVC). By replacing these chemicals with soy-based additives, Battelle hopes to minimize the chances that PVC will adversely affect drug purity or potency, explains Kelly Jenkins, program manager of Battelle's polymer center. Unfortunately, the special properties of these materials usually don't come cheap. To keep costs down, many of Unimark's customers are actually shying away from engineering plastics. A few years ago, these manufacturers were making medical devices out of what Joe Pack, Unimark's vice president of sales and marketing, calls "strange materials." This was done mainly for marketing reasons and to differentiate a product from its competitors. But those reasons are no longer sufficient to justify the extra cost of special materials. Customers "have to have a fit-and-function reason for using those materials, or they won't do it," Pack says. The development of molding materials still lags behind that of molding machines, which are more efficient and more precise than ever before. For many OEMs, he adds, the choice of materials is now driven more by price than by function. To get a price break, large medical device companies are making their own deals with material manufacturers. Engineers at these companies try to use only the discounted materials when designing new products. Manufacturers are also being more careful about using plastic additives. "In the past, you might use a plastic with five different additives in it," Pack says. "Now you don't use the additives unless you have to have them." For cost-conscious manufacturers, there's at least one additive on the market that's actually designed to reduce costs. This additive, known as MuCell, produces air bubbles in plastic resins, Stichler notes, thereby reducing the weight of finished parts. Material costs are being reduced in other ways as well. "We're asking plastic parts to do more than they did 10 years ago," says Jenkins. "Everything's being reduced by weight and by wall thickness." Today, Jenkins notes, molders are getting down to wall thicknesses of about 0.02 in.-half as thick as the walls of conventional injection-molded parts. Molding these thin-wall parts requires both new materials and new processing methods. As their name suggests, high-flow materials flow more easily than the conventional materials from which they're derived. According to Jenkins, high-flow materials include a flow agent that boosts their melt-flow rate to 20-30 g/10 min. Molded devices have played a large role in the advancement of minimally invasive surgery. High-flow materials hold up well to the extraordinary pressures generated by thin-wall injection molding. During thin-wall processes, Jenkins says, pressures can reach 40,000 psi, compared with pressures of 10,000-20,000 psi typical of conventional injection molding. Such high pressures can produce tremendous shear forces that damage plastics. But because they flow more easily than ordinary plastics, high-flow materials are subjected to less shear force, which reduces processing damage and helps the materials maintain their ultimate strength. As material flows, it's cooled by contact with the chilled walls of the mold. Eventually, the cooling process brings the material down to its transition temperature, at which point it stops flowing and solidifies. This happens more quickly in thin-wall molding because the thin mass of flowing material doesn't maintain its heat as well as a thicker mass. As a result, Battelle and others are working on methods to increase the "flow length" of thin-wall molding materials. In one scheme, directed energy is used to heat the flowing plastic, which extends the time it remains in a liquid state. Another technique features a special high-flow nozzle that increases flow length by ensuring random orientation of injected material. Molding materials may have come a long way in recent years, but their development still lags behind that of molding machines, contends Gary Hengeveld, vice president of Inland Technologies. In the next three to five years, however, Hengeveld expects plastics manufacturers to gain greater control over the properties of their materials. Today, for example, a molding material might have a melt-flow index of 10 to 15. "That means that one lot might push real hard and another lot might push real easy," Hengeveld explains. "So your molding machine has to adjust to that." Hengeveld believes manufacturers will dramatically reduce the spreads of melt-flow indexes in the coming years. Instead of 10 to 15, the spread of a future material may be only 14 to 15. The result: fewer machine adjustments and molded parts with more-consistent dimensions from one lot to the next. Of course, material developments are only half the injection molding story. The other half deals with injection molding equipment and processes, and the drive to make them more efficient, more precise, and more capable than ever before. One process that's becoming increasingly popular is two-shot overmolding. This process consists of two molding operations that combine to make a single part. First, the basic plastic part is formed. Then, before the part comes out of the press, a second shot overmolds another material onto the part. Manufacturers often use two-shot overmolding to add a gripping surface to medical devices. "You get rigidity from the first material, and on top of that you overlay another material that gives the product a softer feel," Shah says. Other second-shot additions include gaskets, bumpers, and materials of different colors. "Customers who used to get a four-piece part now want a one-piece part in two colors," Pack says. In addition, Unimark uses two-shot overmolding to make syringes with a functional layer and a sterilization layer. As medical products get smaller, so do the injection molding machines that make them. "We're seeing a downsizing of injection molding equipment," Jenkins says. "Part sizes are driving down machine sizes." At Battelle, Jenkins and his colleagues have a custom-built machine they refer to as a "desktop" injection molder. Measuring about 2Â½ ft long and 1 ft wide, this fully functional injection molding machine includes scaled-down motors, drives, and all the other components found in larger machines of its kind. But in the realm of the small, there's much more to successful injection molding than making tiny machine components. "When shot size is in the milligram range, it doesn't take much screw travel to inject your shot," Jenkins notes. "How do you do that with a great deal of accuracy?" Process accuracy becomes ever more challenging as the size of the molded part shrinks. "If you're dealing with micron-sized features, you don't have to be off much to be out of spec." Not surprisingly, machines that can do the job aren't easy to build. "In the past, we used off-the-shelf components to make these machines," Jenkins says. "Now they're designed and engineered from the ground up." Whether they're large or small, old hydraulic molding machines are being replaced by all-electric machines. Electric machines eliminate the danger of oil contamination posed by their hydraulic counterparts, DeAngelo says, which makes them ideal for cleanroom applications. Moreover, he adds, electric machines are as much as 85% more energy efficient than hydraulic machines. And they allow true computer control, which greatly improves shot-to-shot repeatability and accuracy. "We want our products to be the same from the first unit to the 10 millionth unit we make," DeAngelo says. "The electric machines help us reach that goal." Now, all-electric technology can also control mold tooling. Mounted to the tooling, ac servodrive motors are taking over functions that are usually handled by hydraulic equipment. Besides eliminating the danger of oil contamination, electric tooling equipment is more accurate than a hydraulic cylinder, DeAngelo notes. "With an ac servodrive, you can set [the tool] to move 2.874 inches, and it will move exactly 2.874 inches," he says. "You can't get that type of control from a hydraulic cylinder and fluid. With hydraulics, there's always some slack and some play." DeAngelo says manufacturers need precision accuracy if they want to automate their molding operation. No longer a luxury, automation has become crucial to the success of American injection molders, according to Allan Johnson, manager of sales and marketing for Scientific Molding Corp. (Somerset, WI). "Because of foreign competition, U.S. molders have become much more automated during the last several years," Johnson says. "And the rate of automation continues to increase. At this point, I doubt if there are any molders that are serious about being competitive that don't have robots and pickers on every press." These machines can slash the amount molders spend on labor, which accounts for about 30% of the cost of a typical part, according to Bill Pittman, vice president of OEM services for DeRoyal Plastics Group (Powell, TN). In addition, automation dramatically improves the repeatability of the molding process. For instance, Johnson says, "if you're molding metal inserts into parts, those metal inserts are put into the tool exactly the same way each time, which means they'll be in exactly the same location in the plastic part each time." What's more, the timing of each operation is almost exactly the same every time. "You have repeatability from one part to the next, down to minute fractions of a second," Johnson says. If you depend on a human operator, a task might take 7 seconds one time and 17 seconds the next. In that extra 10 seconds, mold and material temperatures can change. "So you have a potential for changes in part dimensions, part quality, and even the surfaces or aesthetics of the part. But with a robot, those parts are identical time after time." As manufacturing becomes more automated, inspection and process control are following suit. "A lot of customers are telling us: 'You're required to have your process in control,'" Pack says. "So tools that help us do that are becoming a big deal." Automated process-monitoring equipment includes computers, sensors, machine vision systems, and coordinate-measuring machines. According to Pack, most molding presses come with a local process-monitoring system. Molders can also purchase off-the-shelf systems that monitor process variables such as time, temperature, pressure, and position. Process monitoring "is a big selling point for us," says Pittman, whose company uses an off-the-shelf system that keeps tabs on mold temperatures, water pressure, injection pressure, and cycle times. The data are collected and stored so the company has a detailed history of every part it makes. "If we make a bad part, we can go back and look at our process to see why the part was bad," Pittman says. Monitoring systems also enable molders to analyze process and part-dimension data in real time. By contrast, Johnson says, it might take a human inspector half an hour to go through all the manufacturing data. And even then, the inspector might not be able to interpret the data without calling in someone else. If a process variable moves out of its preset range, an automated monitoring system can set off an alarm or shut the press down until a technician looks at it. The molding operation can also be set up so that when a process variable moves out of range, the parts made during that time are separated from the rest of the batch. The process deviation "might not have been enough to push the parts out of spec, so I might have thrown away good parts," Pack says. "But I'd rather get them out of the stream so I'm sure I'm not shipping any defective parts. If a customer gets a bad part from us and that part gets to one of his customers, we've lost him for life." Not to mention, Pack adds, "we could be involved in a lawsuit." Some of Unimark's customers want written certification that the molding process was in control the entire time their parts were being made. In addition, customers are now asking for process data. No problem, Hengeveld says; thanks to PC-based controllers, it's easy to send process information to customers who want it. In the past, many machine controllers used a language specific to one type of machine. But with the spread of PC-based controllers, Windows software has become common in molding equipment. "This lets you download process data into a normal computer and send it to a customer," Hengeveld explains. Injection molding has been changed by a host of new technologies aimed at improving the process and its products. New materials offer a variety of properties and increase the options of designers. New molding techniques and machinery turn out better products and hold costs down. And sophisticated monitoring equipment keeps a close watch on process variables to boost accuracy and repeatability. Taken together, these innovations add up to a boon for medical device OEMs shopping for injection molding services. While the demand for medical packaging has been slowly but steadily increasing for the past several years, that demand is expected to increase much more rapidly with the onset of combination products and other developing technologies. Such products, which combine drugs with medical devices, could also create more symmetry between the pharmaceutical and medical packaging industries, according to several industry experts. That symmetry could include the sharing of anticounterfeiting technologies and FDA regulations. The latest research shows that the medical packaging industry continues to experience slow, steady growth. A recent study by The Freedonia Group Inc. (Cleveland), "High Visibility Packaging to 2008," projects a 5.1% annual expansion in U.S. demand for high-visibility packaging, to $7.2 billion in 2008. According to the study, that growth will be driven partly by trends driving greater product security requirements and by packaging choices designed to deter theft. Clamshell demand is expected to rise 6.4% to 2.5 billion in 2008. The medical device and pharmaceutical markets in general represent the strongest growth opportunities for high-visibility packaging, the study adds. Gains should also be propelled by the advantages of compliance and security features as well as distribution efficiency for institutional users. The Freedonia Group also released a report in 2003 that projected the U.S. demand for sterile medical packaging to climb 5.2% annually, reaching 1.8 billion in 2006. The fastest growth was predicted from custom surgical trays, prefillable syringes, and plastic bottles. Sterile-tray demand was projected to grow 6% per year to reach $476 million in 2006, prefillable-syringe demand was projected to increase 5.6% to hit $215 million in 2006, and plastic bottles were expected to grow 6.5% and reach $130 million in 2006. In addition, the report says that plastic resins, including high-density polyethylene, thermoplastic polyester, and polyvinyl chloride, will account for more than 70% of the materials used in sterile medical packaging by 2006. Another 2003 report, conducted by Alexander Watson Associates BV (AWA), an international market research and marketing consultancy, suggests that ongoing changes in medical and hospital practice, such as the drive for cost reduction, shorter hospital stays, and less-invasive surgical procedures, have been at the root of the recent slow growth of the medical packaging market. The report also noted that pouches, tubing, and thermoformed trays are experiencing the highest level of growth as applications using bags and wrappings are replaced. Simultaneously, current trends are moving toward film or paper-film laminates and away from standard paper packaging. The study also reported that both disposable and single-use medical devices will help increase future demand. Disposable devices, such as electrode terminals and other diagnostics, are already on the rise, along with transdermal patches for drug delivery that use hypoallergenic adhesives and high-performance release liners. Their popularity has extended into the realm of over-the-counter (OTC) personal care products, like facial pore strips and antiwrinkle pads, the study says. Additionally, single-use devices are quickly replacing multiple-use applications in the United States and Europe. The total U.S. market for medical devices currently exceeds $55 billion and continues to grow, according to a 2002 Frost & Sullivan report on R&D and future growth of the medical device market. Like the other reports, the study points to the aging population and technological advances that help improve health and lengthen life-spans as driving forces in that growth. Much of the next wave of growth could come from overseas, leading to a whole new level of competition and cost considerations for medical packagers. According to the AWA report, the medical packaging market is currently growing at the fastest rate in Africa, Asia, and the Middle East. Those regions are warmly embracing the developments and advances in the traditional medical packaging markets in their wars against infection. At the current rate of growth, that combined market is expected to equal that of North America and Europe by 2007, according to the study. The Frost & Sullivan report also summed up what will likely be the primary catalyst for medical packaging's future growth: line-blurring products that combine a medical device with a pharmaceutical formulation, such as drug-coated stents. "Combination products are expected to drive future market growth and be the key to bringing in revolutionary therapies," write the report's authors. Most industry observers agree with that assessment. "Complexity is in-creasing on all fronts," says Laura Bix, assistant professor, Michigan State University School of Packaging (East Lansing, MI). "The growth of drug/device combinations is one major indicator of that." "There's no question that more drug/device combination products will be entering the marketplace in the near future," agrees Hal Miller, president of PACE Solutions (Warren, NJ). Miray Pereira, global business manager, medical packaging, DuPont (Wilmington, DE), is equally certain of that fact. "The medical device/pharmaceutical overlap is the biggest trend right now, and it will only get bigger," she says. "These kinds of products are just in their infancy right now." According to Bix, this evolving landscape of medical products will definitely change how some packagers operate. "This is going to force medical packaging companies to become more familiar with pharmaceutical packaging regulations," she says. "That could be challenging." Hal Miller concurs. "Products such as drug-eluting stents, orthopedic implants with genetically engineered human protein, and antibiotic bone cement often do not fit neatly into traditional categories of FDA-regulated items," he says. "One of the key issues that will arise is how to terminally sterilize these products effectively without deteriorating the drug or killing live cells or proteins. New applications or cycles of traditional terminal sterilization methods may be what are required." Medical packagers will also likely have to consider investing in anticounterfeiting technologies. "Counterfeit products and packaging were prevalent in 2003-2004 not only for pharmaceuticals but also medical devices as well," says Miller. "Overt and covert anticounterfeit methods will continue to evolve for medical packaging going forward." "If FDA finds tremendous gains and advantages from track-and-trace technologies in the pharmaceutical world, they will probably develop similar initiatives for medical device packaging," predicts Bix. "That is already a rapidly emerging trend," says consultant Douglas Stockdale, President of Stockdale Associates Inc.
Stockdale considers RFID implementation a sure thing. "If you can add electronics to a package that's gamma sterilized, using new technology, it will be successful," he says. "Using RFID tags might change the processing parameters, but it would be effective." He also predicts that bar coding will find its way into the medical packaging arena. "If it's successful in pharmaceuticals, FDA will probably look at transferring that mandate to devices," he says. Even with increased demand for their services, packagers will still have to maintain a focus on controlling costs, always at the top of the list of biggest concerns. "The supply chain pressures are always going to be there, and also the margins in medical packaging are not high compared with other industries," points out Pereira of DuPont. The potential of adding more security packaging into the mix suggests obviously higher manufacturing costs. Pharmaceutical packaging has other implications for medical packagers as well. "One issue worth pondering is what will happen to medical devices if the purchase of non-U.S. pharmaceuticals is allowed," says Hal Miller. "Will hospitals be permitted to buy cheaper, non-FDA-approved medical devices to keep their costs and managed care costs down?" Stockdale predicts that packagers will respond to cost challenges with smaller, yet sturdier, package designs. "It just makes sense to reduce the package size," he says. "You can then ship more product at once and save money in freight, which offsets the material costs." He also says they'll continue the trend of analyzing the "entire life cycle of the product," instead of focusing solely on materials. "Take distribution costs, for example," he says. "If you can reduce the package size, you can then switch from a size to weight focus when weighing it." Another potential cost-cutting move that medical packagers will likely continue exploring is moving business off-shore. And that brings a whole new set of challenges. "As manufacturing continues to move offshore, today's multinational packager must be careful in the selection of suppliers." "Suppliers may work locally, according to local cultures and practices, but goods must meet the standards of quality dictated by the consuming market. The effectiveness of the liaison between parent company and satellite is also critical." Package integrity testing will continue to be an integral part of the picture in the near future. "Two of the big challenges ahead for packagers are to develop a whole-package integrity test for those packages using porous materials such as Tyvek and paper, and to scientifically determine how small a hole or seal channel needs to be to be considered acceptable for sterility maintenance," says Miller. He adds that testing, documentation, and validation are critical factors in the effort to eliminate packaging errors. With that in mind, some anticipate the development of new test methods. "There are already some in the works that will cut some of the typical capital equipment costs," says Barcan. Again, combination products will more than likely lead to testing changes. "How to deal with coated stents is going to become a testing issue," says Pereira of DuPont. "The dynamics of the product and package will be different, for example. Also, in the last few years we've seen more procedure packs on the market and more recycling of products." Sterilization methods might also change. "I'm seeing more interest in packages that are amenable to greater flexibility in sterilization methods," says Pereira. "Different sterilization processes are definitely being explored," adds Stockdale. "Right now, I'd say it's 45% radiation, 45% ethylene oxide, and 10% steam sterilization and other methods. Those 'other methods' will get to be a bigger piece of the pie. Vaporized hydrogen peroxide, for example, is gaining popularity." Steam sterilization is a "huge challenge," according to Barcan. "You have to develop materials and designs that can put up with the extreme conditions of the format," he says. Vacuum packaging is also growing. "It gives you added protection," says Barcan. "Companies are also developing new sealing equipment to be used with these systems. Device manufacturers and packagers will also be paying careful attention to regulatory developments in the coming months. "We're anxiously waiting to see what FDA will do with its decision to hold third-party reviews and audits," says Pereira. But FDA isn't expected to announce any new decrees. "They're still wanting compliance and wanting companies to do a better job protecting device users and the devices themselves," says Stockdale. Pereira says companies are also starting to look to their converters and suppliers to provide FDA-mandated information regarding materials. "For example, they're asking converters to provide biocompatibility data and information on accelerated aging of seal structures," she says. Higher on the radar screen is the ongoing set of revisions to ISO 11607, "Packaging for Terminally Sterilized Medical Devices." The newest version recently became harmonized with the European Committee for Standardization's (CEN) EN 868-1, which is followed by most European device manufacturers. CEN still has not decided whether to update the standard to expand it to include processing and validation. "These are living documents. They should be allowed to be reviewed and changed, as should test methods," says Barcan. ISO 13485, which covers quality systems for devices, is also in the process of being revised. No matter what transpires over the course of the next few years, medical packagers will be dealing with new challenges. "It's a very interesting time for medical packaging," says Laura Bix from Michigan State. "There are increasing demands from consumers, and those voices will become louder as they age. They're going to need to take devices home with them more and more, and as a result, packagers will need to design with ease-of-use in mind." Yet with those challenges will surely come growth in demand. "It shows no signs of slowing down," says Bix. "I would expect that growth will stay very healthy as we move ahead." Most plastic parts in medical devices and diagnostic equipment are formed by injection molding. This process, which can involve temperatures above 600Â°F (315Â°C) and pressures that reach 30,000 PSI (2040 bar), balances many part-design, resin, and molding factors to create sophisticated components that withstand the rigors of medical use. Despite its complexity, injection molding is simple in concept: plastic is melted, injected into a cavity, and removed when it has hardened. As shown in Figure 1, the machines used have an injection section that first plasticizes, then pushes the resin into the mold, as well as a clamping mechanism that opens and closes the mold. The process is economical, efficient, and precise, and yields little waste. In designing plastic components, medical manufacturers need to account for the intricacies of this processing method and the considerations involved in its use. Injection molding starts with small plastic pellets, usually about 1Â¼8 in. (3.2 mm) in length. These pellets are fed from a hopper on a molding machine into a reciprocating screw, which carries them through a heated barrel. Shear generated by the flights of the screw melts the plastic as it is conveyed toward the front of the barrel and mixes the melt so it is uniform. The screw retracts as molten plastic accumulates in front of it. When enough plastic accumulates to fill the mold, the screw is pushed forward hydraulically. This forces the melt, or shot, through the machine nozzle and into the closed mold. In the mold, the plastic flows through channels called runners and passes into part cavities through gates. Water or another fluid circulating through a cooling system in the mold extracts heat. The plastic is held at high pressure until it solidifies, or freezes off, at the gates. After parts have cooled and solidified enough to be handled, the mold is opened and the parts are removed. As parts cool in the mold, the next shot is plasticized in the barrel. After ejection, the mold is closed and the process is repeated. Because it is usually the longest step in the process, cooling time often determines cycle time and, thus, production rates. Double-shot molding, a two-step process that injects one color or material first. After the first shot hardens, a second color or material is injected into or around the initial shape. Push-pull molding, which involves multiple layers having different orientations. Part properties are more uniform than if they were molded from just one direction. Fusible cores, which create complex, hollow structures. Heating the part after molding melts the core, which flows out of the part. Gas-assisted injection molding, in which an inert gas (often nitrogen) is forced into the melt as it enters the mold. The gas packs the plastic into the cavities to reduce cycle time, part weight, warpage, and stress in the cooled part, and minimize other problems. In working with injection molding, designers and manufacturers must pay attention to many interrelated variables in order to create viable medical parts. Each aspect of the process, from part design and the resin used to the machine and the conditions chosen, involves numerous choices. Moldability is often a key factor in choosing a resin. How well a plastic flows, transfers heat, and shrinks as it cools affects the molding process. Viscosity, for instance, influences cavity filling and the type, size, and placement of gates, as well as the temperature and pressure used. Heat-transfer coefficient affects how the cooling system is configured to prevent part warpage from differential cooling and shrinkage. Shrinkage is also important in sizing mold cavities so part dimensions fall within the tolerances set. Shrinkage is influenced by injection temperature, how quickly a part cools, and orientation (how the molecules and/or any reinforcing fibers in a resin align as it flows into a mold). It is also affected by a part's wall thickness; e.g., thin areas shrink least. Shrinkage can be the deciding factor in material selection. Selecting a molding machine and determining the optimum processing variables to produce a specific part also involve a great many variables. These range from barrel temperature, injection pressure, screw speed, and shot size in the injection section, to cavity pressure, mold temperature, gate size, venting to allow the escape of gases, the clamping force that holds the halves of the mold together, and much more. Mold tools form the heart of the molding process. They should be designed to allow as broad a processing window as possible so such variables as hydraulic pressure, barrel temperature, and screw and barrel wear can shift over time without harming part quality. Tool design must account for how a resin enters a cavity, what happens once it is there and how the part can be released smoothly. Elements to be considered include gating, draft, runners, cavity number, slides, cooling channels, placement of parting lines where the mold opens, ejectors, and the metal used for the mold. Gates should allow the molten plastic to flow smoothly to the limits of the cavity. Designers adjust gate type, size, and position to account for factors such as cavity pressure, mold-filling time, and how resin molecules and fibers align to strengthen parts. Gates can be moved to hide flow lines that form on a part's surface as resin passes through a gate or to relocate weld lines (weak areas where two or more melt streams meet after flowing around a core) to non-critical areas. Many part elements are given a slight taper, or draft, in the direction the mold moves as it opens. This enhances removal of parts from the tool after the resin shrinks and cools. The draft is usually less than 3Â° per side. It can be affected by surface finish (the higher the polish, the less the taper), the length of the projection, and resin shrinkage. The runner system affects how much scrap is produced. Conventional cold runners create a lot of scrap, which is often reground and reused. Hot runners yield no scrap, but cost more and are harder to operate. They are especially useful when runner volume is large relative to part size. The number of cavities per tool varies with part size and production volume. In other words, higher volumes and smaller parts usually mean more cavities per tool. Precision parts are often made in tools having fewer cavities. The cost of mold tools is driven up by the need for special features. Parts having deep recesses, screw threads, or holes or depressions perpendicular to the direction the mold opens, for example, may call for unscrewing or collapsing cores, side-action slides, multiple plates, automatic unscrewing devices, intricate parting lines, and other release mechanisms. In one case, special tool features were essential in molding the lid of a disposable surgical device from Stryker Instruments (Kalamazoo, MI) that mixes and applies polymethyl methacrylate bone cement. The device has three injection-molded elements made of a cyclic olefin copolymer (COC): the lid, a mixing chamber and a delivery cartridge. The 2-in. (51 mm) diam mixing chamber screws onto the lid that also has a vacuum port with a Luer fitting. The tool for the lid required three unscrewing cores for its three threaded portions. Also, since the COC used has almost no mold shrinkage, draft was carefully adjusted to prevent parts from sticking in the mold. 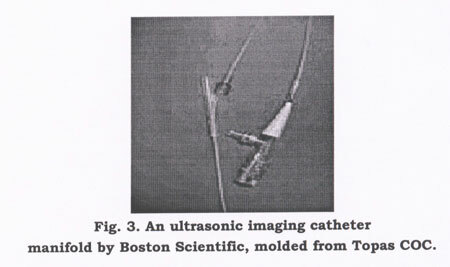 Special features were also important for the Y-shaped manifold that ties key components together in an ultrasonic imaging catheter made by Boston Scientific (Natick, MA) and used to detect aneurysms in arteries. Molding this part involved an intricate tool and two fragile core pins with diameters that match the inner diameter of the insert-molded lumen tubes. The pins are inserted into the tubes and extend up the arms of the Y so the lumens do not collapse as resin flows in the mold. The manifold is made in a single-cavity tool with one gate and a cold runner. The complex interplay of a great many variables in the injection molding process poses severe challenges for designers. Just having to meet tight tolerances, for instance, affects the resin and fillers, mold cavity layout and the gating, cooling system and release mechanisms chosen. The molding machine itself also affects tolerances in terms of how well it controls temperature, pressure and clamping force. Designers cope with the complex, often non-linear task of configuring mold tools by using computerized approaches like finite element analysis (FEA) for structural and mold-filling analyses (MFA). Linear structural FEA can be used to determine displacement and various stresses and strains in a part. MFA evaluates filling pattern and pressure and temperature distributions to optimize resin flow, gate position, the location of weld lines, and other factors. Other numerical tools include mold cooling analysis, which gauges the effectiveness of the mold temperature distribution system, and shrinkage and warpage analyses, which evaluate dimensional control and predict molded-in stresses and warpage. 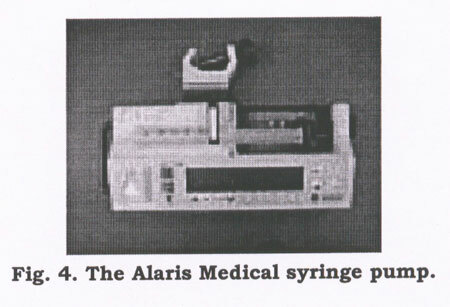 Mold flow analysis was essential for the designers of an element in a syringe pump from Alaris Medical Systems (Basingstoke, UK) that meters and dispenses drugs during drip feeding. Alaris used a polybutylene terephthalate (PBT) to replace five metal and plastic parts in the declutch tube of its P-series syringe pumps with a single injection-molded component. The 173-mm-long declutch tube on this electromechanical pump disengages 5-to 100-ml syringes from the unit's transmission. The tube is injection molded around a core pin. Mold flow analysis was used to ensure that the cavity would fill without problem. This involved evaluations of the melt front; temperature and pressure across the mold, cooling time to define cycle time, and assessment of weld lines. In molding, the PBT enters the cavity from a gate at the base of the component and gives an even fill in just over 0.5 seconds. Mold cooling was adapted to ensure that the core pin remained straight as the part hardened. Design for moldability can involve close coordination between the designer, molder, and resin supplier. This was the case with the complex ergonomic handles for a minimally invasive surgery forceps made by Surgical Innovations Ltd. (Leeds, UK). The handles have eight molded elements, including a cone that transmits rotation and a complex central core with stainless-steel inserts. The core supports the other elements. The elements in the handle are molded in glass fiber- reinforced polyphenylene sulfide, which meets tolerances as demanding as 0.002 to 0.003 in. (0.05 to 0.08 mm). Computer-aided flow and structural analyses for the core demonstrated that the thin-walled cone would fill out in molding. Gating for the core was adjusted so the resin was fed from the end to control weld lines and stress (most cylindrical parts are fed from the center). Wall thickness is important in designing for moldability, especially because of its effect on cycle time. Too thick a wall, even in just a small portion of the part, can lengthen cooling time and increase part cost. If stress or deflection under load is high, ribs or other reinforcing features can be added to build strength without thickening walls. To avoid a heavy mass that can extend cycle time, several thinner ribs are better than a single large rib. Mold design should account for how a part will be assembled. Many assemblies use snap fits to join parts economically and rapidly. These have molded elements that flex and return or nearly return to their unflexed positions. Snap fits generally need undercuts, thus requiring molds with side action features. If mated male and female threads are used, the internal threads will need an unscrewing or collapsing mechanism. External threads can often be molded by splitting them across the parting line. As medical devices grow more sophisticated, designers are asking more from the molding process and materials that they use. The LabCD from Tecan (MÃ¤nnedorf, Switzerland) is a good example of a unit that pushed the limits of molding technology. This disposable, microfluidic device performs 48 drug-screening assays simultaneously. The disk is 5 mm thick and 124 mm in diameter and has upper and lower halves that are bonded together. One half has microchannels as small as 50 Âµm in width and depth; the other contains storage and measurement wells. Tecan used COC for the disk because, in part, it is an optically clear material that replicates the microchannels and reservoirs with a high degree of accuracy. In processing, the molder, Weidmann Plastics Technology (Rapperswil, Switzerland) used a proprietary injection molding process and a modified press to form the microstructures. Weidmann developed special mold inserts having 50-Âµm-deep channels by adapting advanced etching and micromachining methods. This process gave such fine control that a draft angle between 1Â° and 3Â° was added to the channels. The inserts are made of a nickel alloy with a Rockwell hardness of about 50 so that they hold all critical dimensions. Whether it involves a straightforward part or one that extends injection molding into new territory, the process finds extremely broad use in fabricating elements for medical devices and equipment because it is often the most efficient and lowest-cost way to make a component. In order to make the best possible use of this process and to gain the high performance needed in medical products, manufacturers must understand the process in detail and the interplay of the many part, resin, and molding factors it involves.